Over at the Delphi Science blog there is a blog post about creating a TVariantColumn for the Delphi Firemonkey TGrid component. It expands the capability of TGrid to allow for various different components to be used within the same column of a TGrid. The example of using this type of functionality is for building an object property editor with Delphi Firemonkey. It looks like this component was created for XE3 but I don’t see any reason why it will not also work in Delphi XE5 Firemonkey. It also only talks about Windows an OSX but I don’t see any barriers to it also running on Android and IOS. The different types that can be used in the column are listed as follows: TTextProxy, TCheckProxy, TSwitchProxy, TRadioButtonProxy, TProgressProxy, TPopupProxy, TComboProxy, TColorComboProxy, TComboColorProxy, TImageProxy, TDateProxy, TTrackbarProxy, TCustomProxy. 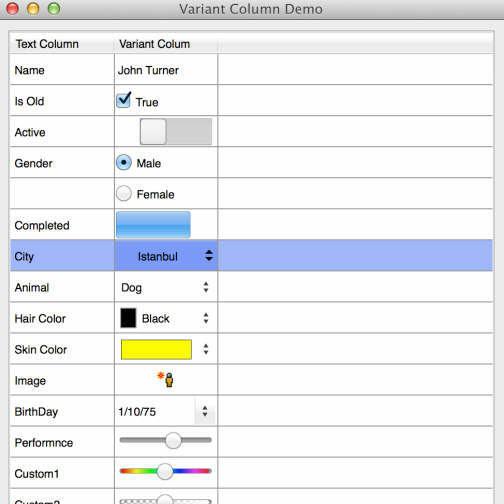 You can also create your own Proxy components which can also be used in the TVariantColumn. The component is free and I’ve included a mirror of the source below in case the original goes down. Check out the full blog post for yourself and download the component source code.